Top 7 Mac & Windows Keyboard Shortcuts - SOL-I.S. As busy people with jam-packed schedules we are always in search of more efficient ways to accomplish our tasks. 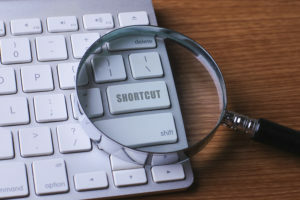 Fortunately, when it comes to word processing – whether with a Mac or Windows operating system – becoming familiar with and utilizing shortcut commands is one excellent way to streamline our process and save ourselves a little time. As opposed to relying on our mouse or trackpad to accomplish basic functions we can simply utilize a combination of keys. Let’s take a look at the seven most widely-used shortcut commands for Mac and Windows – cut, copy, paste, undo, select all, find & print. As opposed to a Command button, Windows keyboards contain a Control or Ctrl button. This button functions in the same way. Aside from the fact that the button is identified with a different label, the corresponding letters for each function are identical. You will notice that, with Windows, there is an alternate way to perform the Copy and the Paste function as shown in parenthesis. If you would like to learn more about time-saving word processing functions or are in need of any other IT services, don’t hesitate to give us a call at 952.279.2424!